Are Standing Meetings Scuppered By Social Awkwardness? Awwwkkwwaarrd. Are standing meetins really as effective at increasing urgency and attentiveness as they are preported to? Meetings are one of the most frustrating aspects of modern working life, with few of us enjoying them, yet most of us suffering a growing number during a typical day. Some believe that standing during the meeting renders them more productive as being upright gives them a sense of urgency that is often lacking. Alas, recent research from King's College London and Brunel University London suggests that participants struggle during such meetings as standing appears to break the social rules of the meeting. Standing meetings have a number of advocates, not only because they believe they make meetings more productive, but they also break up the sedentary lifestyle of the typical office worker. Indeed, concern over prolonged sitting is growing, with research linking it to a range of health issues. "Sedentary office work is an urgent public health issue," the authors say. "For some employers, such as software developers, standing meetings are commonplace. We need to get to the point where standing is the new normal for workers who would rather not be sat down." The researchers explored the rather unnatural-seeming scenario of meetings whereby some participants are standing, and some seated to try and identify barriers to getting people on their feet. Participants were asked to stand in three different meetings, until it no longer felt appropriate to do so. "We found that standing in meetings is a social minefield. Our participants often felt awkward about standing — they felt more visible to others, and worried that other attendees would think they were 'attention seekers'," the authors say. Participants reported a range of emotions, from awkward to stupid, and reported feeling like they were breaking various unwritten rules of the meeting. This was particularly so informal meetings or when addressing sensitive topics. This forced many standing participants to retreat to the margins of the room, and therefore of the meeting itself. Suffice to say, not all of the experiences were negative, with some participants revealing that they felt more engaged in the meeting, and by standing, they were motivated to keep the meeting short. What's more, participants felt empowered when they themselves were chairing the meetings, and they felt better able to stand and retain authority. They were, however, concerned that this could be interpreted as an inappropriate assertion of power, especially if they had a high level of seniority in the organization. "Ours is the first study to find out how people actually experience standing up in meetings," the authors explain. "Initial experiences of new behaviors can determine whether people will keep going. 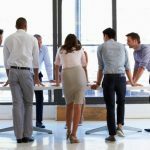 While standing is not a one-size-fits-all solution, it's about creating activity permissive cultures at work where people have the opportunity to move around more." Suffice to say, if organizations do adopt standing meetings, it might be realistic to expect them to be all or nothing rather than a mixture of standing and seated, but if things are more free-form, then these findings can be illustrative of the challenges they may face. In such circumstances, the researchers advocate some rules to overcome any awkwardness, such as mandating people stand if they wish to speak in the meeting. Alternatively, they could equip meeting areas with high tables and stools. Whatever strategy you deploy, take an experimental approach and make sure you get feedback from employees regarding how they feel. Why Should You Be Invited to A Meeting?